SCVHistory.com TL8601 | William S. Hart Park | Resolution: Founders, Friends of Hart Park, 1986. RESOLVED: That these Nine Individuals be now and forevermore, individually and collectively known as "FOUNDERS" and it be further resolved that these FOUNDERS shall be extended all the rights and priviliges of HONORARY membership for the life of the Corporation and be it further resolved that a copy of this Resolution be forwarded to these Nine Founders along with such appropriate mementoes as deemed appropriate. 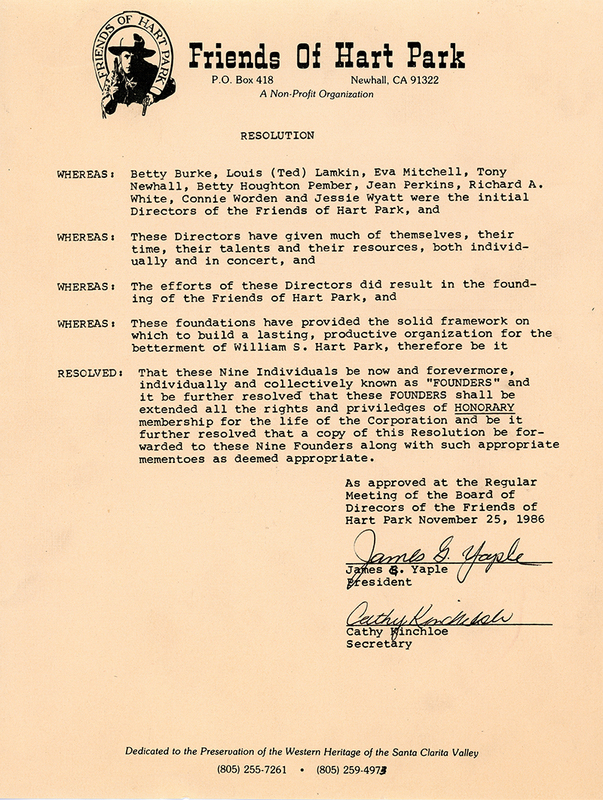 As approved at the Regular Meeting of the Board of Directors of the Friends of Hart Park, November 25, 1986. TL8601: 9600 dpi jpeg from original documents. Ted Lamkin Collection.